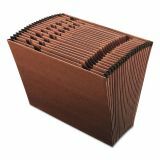 Pendaflex Earthwise by Pendaflex Recycled A-Z Indexed File, 21 Pockets, Letter, Red Fiber - Expanding file features an open top for quick filing and access to filed contents. Red fiber has a leather-look red fiber. Convenient preprinted dividers separate papers into easy-to-find categories from A through Z. Reinforced gusset tops prevent bursting and tearing. Expanding file is acid-free.